I really liked the place, quiet , you feel like you are in the middle of the Jungle, when you wake up, all the sounds of birds, loved it - it's a pity that the cafe was closed, would loved to eat some salad....or other stuff - the welcome was very nice, lovely people there -kitchen was nice, liked the little squeezer to make juice, exactly what I needed :-) - had some nice movies there !!! - after 5pm , there is nothing to buy anywhere, check that you have everything what you need for the first night !!! Location was perfect, couldn't have been better. Ana was awesome, so accommodating, down to earth and genuinely hospitable and friendly. Coffee fabulous. Food delicious. Local souvenirs. Bed comfy. Bath was relaxing and comfortable. Didn't have to move the car once. Everything at our door step. Ana was a wonderful host who couldn't do enough for you. This historical cottage was at The National Park entrance just minutes from the waterfall. Bed was super comfortable and cozy. Ana was a super nice host, the house was very comfortable and very clean. The location was amazing too, in the middle of the rainforest next to the waterfalls in springbrook national park. The apartment was much bigger than it seemed on the pictures. I can absolutely recommend this apartment! It was a one-kitchenette downstairs and upstairs one-bedroom, one sitting / TV room and bathroom quaint cottage beside a national park waterfall entry point. So, plenty of room and beautifully situated. Comfy bed. Fans in both upstairs rooms helped reduce heat. I liked that it was above a specialty cafe with great food. Plus, the cafe was open for only 4 or 5 hours during the middle of the day, so no night noise. The host was great, the hospitality was great and so too was the food. Comfortable and roomy. Didn't feel stale and lifeless which is a big thing for me. A peaceful get away located at the edge of the tranquil rainforest. The accommodation was charming and quaint and took up the entire top floor as well as a well equipped kitchen on the lower floor. A lovely breeze filtered through the screened windows. 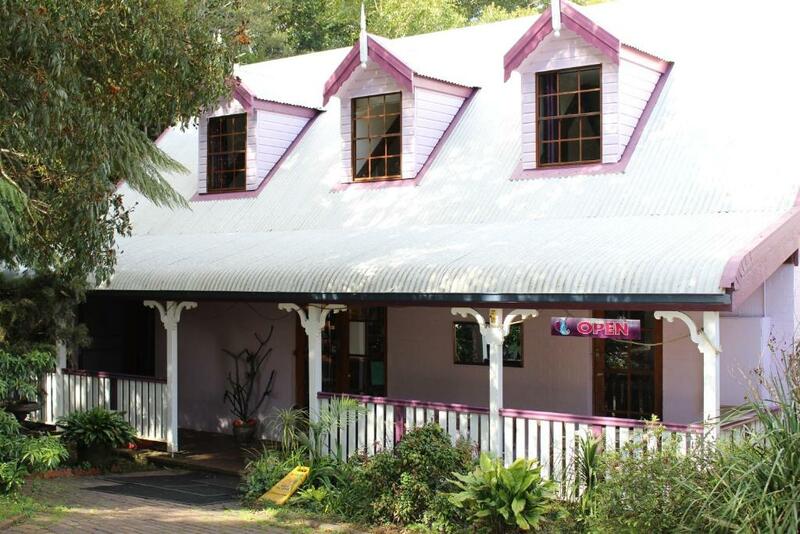 The cottage is located at the entrance of the rainforest park which has wonderful walks to see the amazing waterfalls. A delightful little cafe is located on the ground floor with friendly welcoming hostess. Thanks! Anastasia is a lovely host. The power went down New Years Eve and she arrived with a lovely bottle of red to "ease the pain". The apartment is spacious with a very comfortable bed and roomy living area. And within walking distance to the falls. Anastasia also runs the cafe attached to the apartment serving a delicious array of yummy treats and coffee. It's also a lovely drive to Murwullimbah and Mt Tambourine. A lovely quiet spot for a real wind down and a chance to catchup on those books you've been wanting to read. Lock in a great price for Dancing Waters Cottage – rated 9.2 by recent guests! Located 16 mi from Gold Coast, Dancing Waters Cottage offers accommodations in Springbrook. The self contained apartment is 16 mi from Surfers Paradise. Free WiFi and free private parking is provided. The kitchenette features a microwave, a toaster and a fridge, as well as a kettle. Towels and bed linen are featured in this apartment. Tweed Heads is 17 mi from Dancing Waters Cottage, while Coolangatta is 16 mi away. Gold Coast Airport is 15 mi from the property. When would you like to stay at Dancing Waters Cottage? This self contained apartment features a DVD player, CD player and sofa. The number one key aspect is its close proximity to the national park and Purlingbrook Falls. Purlingbrook Falls is right next door, you can walk the circuit in the morning. Purlingbrook Falls is right next door, you can walk the circuit in the morning. House Rules Dancing Waters Cottage takes special requests – add in the next step! Dancing Waters Cottage accepts these cards and reserves the right to temporarily hold an amount prior to arrival. The cottage was a little musty smelling as were the towels. Extra towels would have been beneficial. Shower was not the best as water went everywhere. Free coffee from the cafe! Actually I cant think of anything. On a very hot day, upstairs was unbearable but it soon cooled down as night fell and the cooler change came through. A small stovetop as well as the electric frypan, would have been handy. the Breakfast supplied was not adequate. The room was not good value for money. The cottage is located above a noisy cafe and as we were leaving we were abused by cafe patronage who were actually seated at the designated cottage table and chairs. Exceeded our expectations. Was much more spacious than we thought it would be and right by the rainforest walk we wanted to do. The accommodation was quiet and relaxing. The apartment is above the Dancing Waters cafe and it is noisy from around 8am so no chance of a sleepin. As we visited in Dec/Jan it was also quite hot in the living area during the day. We were out and about most of the day so not a real issue. You will need to provide your own evening meal and there is limited cooking utensils in the kitchen. You will need to be creative. Breakfast was supplied on the first morning but not replenished for our 4 night stay. Very friendly service from an owner who obviously cares about her visitors. A cosy and comfortable space to stay right in the middle of a beautiful natural area.